Amy was a loving and compassionate wife, mother, sister, sister-in-law, grandmother, great-grandmother and friend. Amy Clementine Hewitt passed away peacefully February 23, 2018 in the Coronation Hospital and Care Centre with her family at her side. Amy Clementine Hewitt was born at the family farm at Hemaruka, Alberta, on August 23, 1930. Amy was one of a family of eight children. She was the first born to Clarence and Ellen Dafoe. Amy attended school at St. Elmo and Lawrence School. She also went to Prairie Bible Institute in Three Hills, Alberta. After finishing her schooling she worked at a hospital in Medicine Hat, Alberta and Fort St. John B.C. as a ward Aid. She then came back to Coronation to work here in the Hospital and Union Cafe. It was during this time that she met the love of her life, Gordon Hewitt. They were married in Coronation on March 30, 1952. They started their married life on a farm on Section 31 in the Talbot district where they raised three sons. Ronald, born March of 1953, Leslie September of 1954, and Darcey August of 1957. They spent many happy years living in the little house at Talbot. Amy enjoyed singing, with Dad in the band and loved any opportunity to sing. In 1967, they moved into Coronation and farmed from there. Amy worked at the Post Office and Builders Merit Store for a time. Amy and Gordon enjoyed camping and fishing, trailering with a tent trailer, fifth-wheel and then a motorhome. They spent many a winter in Arizona with friends, and made more friends. While there she took painting lessons and began to paint on everything; canvas, eggs, cream cans, rocks, spoons, saw blades etc. Amy went on many trips with family and friends and enjoyed every minute. At age 80 Amy flew to England by herself to visit relatives. When a close friend, Ruth Bakken expressed a concern of her going alone, Amy said that she was going with friends she hadn’t met yet. Her last flight was her to her Grand-daughter Amanda’s wedding in Victoria, B.C. last June. She enjoyed her family, friends and was very involved in the community. 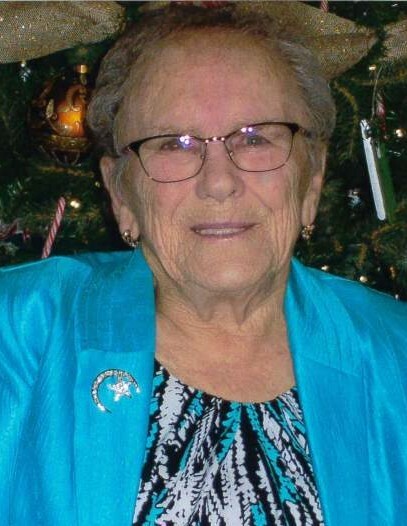 She was one of the first members who started Talbot Homemakers Club, belonged to East Star, United Church Choir, helped with the Farmers Market, Music Festival for numerous years and was still a member of the Royal Canadian Legion. Amy worked very hard on her yard and was very proud of it. Many people used her yard for Wedding pictures. In 1998, they decided to move to Red Deer where they could be closer to medical services. They moved into Waskasoo Estates where they enjoyed many years in that community, making more friends. They traveled to many JAM sessions to listen to local music. Amy looked forward to visits and the opportunity to go shopping with her grand-daughters Amanda and Nicole. In March 2002, Amy and Gordon celebrated their 50th anniversary. Later after Gordon’s passing Amy moved into a condo on Taylor Drive where she made many more friends. She cherished the times with her sister Eunice who moved into the same condo. In June of 2015, Amy moved back to Coronation Assisted Living. She felt right at home knowing most of the residents and their families. She enjoyed all the visits from family, grandchildren, and especially those precious great-grandchildren. She loved the staff at Assisted Living, joining in on making crafts and enjoyed the entertainment that came in to play for the residents. Amy never missed an opportunity to go on an outing with family or the Handy Bus. If someone said “do you want to”, before they said where, she said “yes”. She loved to go to any entertainment in the Community, Castor Little Theater, Preforming Arts, and especially Music Festive and Dancing, watching her great-granddaughters dance. Amy loved her computer, to stay in touch with friends and family by email. She loved to send jokes back and forth. Amy leaves to mourn her passing her loving family Ronald (Ann), Leslie (Sherri), Darcey (Wanda); grandchildren Kyle (Candace), Ryan (Anita), Kevin (Christie), Mark, Jayden (Renee), Dean, Amanda(Johnny) Vaslovic, Nicole; great-grandchildren Teira, Sara, Kayla, Dylanna, Lynn, Julie Kylie, Kenzie, Codi, Seth, Ella, Luke; sisters Nell Glass of Prince George, BC, Eunice Anderson of Red Deer, AB; numerous nieces, nephews, other relatives and many friends. Amy was predeceased by her loving husband Gordon in 2006, father and mother Clarence and Ellen Dafoe; brothers Earl, George and Fred Dafoe; sisters Jean Sankey, Rosemary Leake; sister-in-law Ann Dafoe; brothers-in-law Andy Glass, Bill Sankey, Bob Anderson, Eddie Leake. On behalf of the family, we would like to extend a huge thank you to Dr. Noelle O’Riordan, the Nursing staff at the Coronation Hospital & Care Centre and the staff at DSL. Your excellent care and compassion shown to Amy and her family made the last couple of weeks as comfortable as possible.